Looking for a truly extraordinary experience this summer? Check out the Alberta Birds of Prey Centre located in Coaldale, AB. A 20-minute scenic drive from the Heritage Inn Hotel and Convention Centre in Taber, AB, the Alberta Birds of Prey Centre boasts the largest birds of prey facility in Canada. The centre is not-for-profit, their primary focus is to rescue and release injured hawks, falcons, eagles, and owls back into the wild. Hold an Owl - Each visitor, regardless of age, is invited to have a specially trained owl perched on their arm. Depending on the day, there are usually three types of owls available to be held: Burrowing Owl, Barn Owl and Great Horned Owl. Photos are encouraged, so be sure to bring your camera! Visit with the Residents - Enjoy the beautiful landscaping as you take a stroll around the ponds and view the various aviaries. You will see birds such as the Ferruginous Hawk, Northern Harrier, Great Grey Owl, and Snowy Owls. Each aviary has signs posted with fun facts about the species. In addition, the knowledgeable staff and volunteers are always on hand and eager to answers any questions you may have. Have a Picnic - Find a shady spot at a picnic table by the water as you watch for local wildlife like the Western Painted Turtle, Muskrat or Pelican. If you are lucky, you might even find spot a Great Horned Owl napping in the trees during a warm summer day. The picturesque setting is the perfect place to enjoy a relaxing meal before continuing on with your visit. Watch a Flying Demonstration - See a hawk or eagle show off their incredible flying skills as a trainer talks about flying technics, facts about the species, and stories about life at the Centre. Flying demonstrations are performed every 90 minutes throughout the day (weather permitting). Note: Don’t worry about missing the presentation; before every flying demonstration a volunteer will walk around the site to gather any visitors who may want to view the demonstration. Feed the Ducks - Finish off your visit by feeding the resident ducks. A visitor favorite, duck food is available for purchase at the gift shop. Spread the food on the grass for the ducks to eat or grab a handful and let the ducks nibble the food right out of your hand. Be sure to keep the duck food held high as the ducks are notorious for trying to grab the food bags. Remember to return any empty bags to the gift shop so they can be re-used. After your visit, check out the Alberta Birds of Prey Foundation's Facebook page for photos and stories from the centre all year round. The Alberta Birds of Prey Centre is open to the public 7 days a week from May 15th - September 3rd, 2018. Use the Heritage Inn Hotel & Convention Centre in Taber, AB as your base for an exciting hands-on day of exploring the Alberta Birds of Prey Centre! 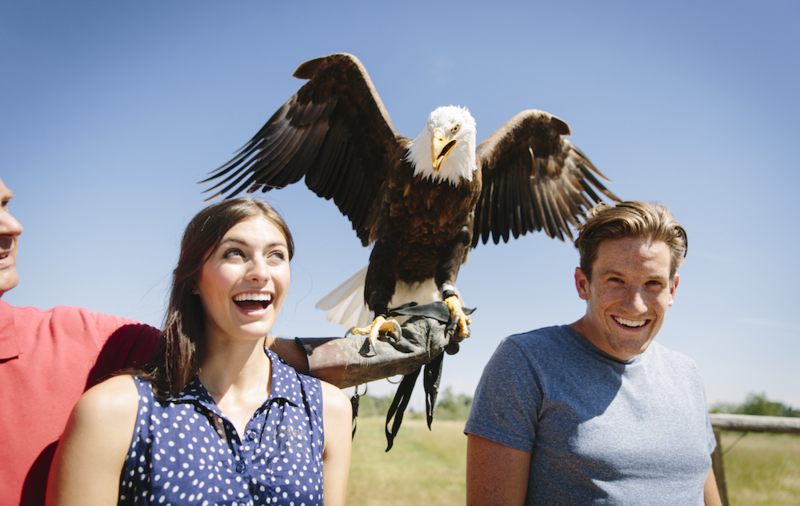 Book our Birds of Prey Get-A-Way Package.